Architect: A. J. Jordan; Construction Superintendant: Professor Silas H. Douglas. Cost: $6,000.00 for the original structure. Cost of original structure and additions throught 1890: $55,845.00. Original structure size: 3,142 square feet, 1 story. Building destroyed by an arson fire. Bricks from the original building have been set into a bench on the Diag by the northeastern corner of the Hatcher Graduate Library. The site of the building can be fairly easily determined by looking at the cluster of small trees off the Diag by the previously-mentioned corner of the Grad Library. Citing the need "to erect a Chemical Laboratory for the analytical courses" in his December, 1855 report, President Henry Tappan speculated that the cost of a small laboratory structure would be "from two to three thousand dollars." Construction was authorized by the Univesity's Board of Regents in May, 1856, on a site immediately to the west of the Medical Building, which was by then over a half-decade old. A. J. Jordan was chosen as the building's architect, and construction was superintended, as with the Medical Building, by Professor Silas H. Douglas. The finished building, providing 3,142 square feet of space, cost double the prediction of President Tappan, about $6,000.00. It was a one story structure consisiting of three rooms. Increasing interest in laboratory sciences at the University necessitated the enlargement of the building three times during the first dozen years of its existence. These three additions--constructed in 1861, 1866 and 1868--increased the number of lab benches in the building from 26 to 135 A fourth additions, a 95 feet by 35 feet wing, was added in 1874, and, in 1880 a second story was added to the building. 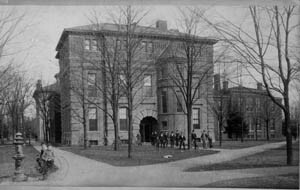 In 1890, with the founding of the University's School of Pharmacy, a sixth addition was required, for which the legislature provided $21,000.00. This large three-story wing was added to the west of the original structure and was designed by E. W. Arnold of Detroit. A final addition was constructed in 1901 to house the Laboratory of Physical Chemistry. With the completion of the West Medical Building (now the Dana Building) in 1903 and the Chemistry Building in 1909, the laboratories were transferred from the original Chemical Laboratory. Because of all of its additions, leading to a very irregular plan, the structure was essentially two buildings. After the laboratories were removed, the northern wings of the building were used by the Pharmacology Department while the southern wings were occupied by the Economics Department. A Christmas Eve 1980 fire ravaged the historic Chemical Laboratory / Economics Building, destroying or damaging many valuable books and manuscripts. The department's Leo Scharfman Library was a total loss. Many fire and water damaged books and documents were freeze dried in University Food Service trucks and the vacuum chamber at the UM Aerospace Building. A U-M employee, who had been fired shortly before the blaze, was later charged with arson. Source: The University of Michigan: An Encyclopedic Survey; Walter A. Donnelly, Wilfred B. Shaw, and Ruth W. Gjelsness, editors; Ann Arbor : University of Michigan Press, 1958.